While much of the furniture design industry spent the past ten years playing it safe with a restrained, minimalist approach, a new expressive style has emerged from within its margins. During this period, a vanguard of up-and-coming and established designers broke away from the norm and started reevaluating the fundamentals of form and function. They began playing around with proportion and anthropomorphic details. All of a sudden, a new slew of limited edition chairs and tables were sporting swollen legs, rounded feet, and even animalistic facial features. On view at A/D/O in Greenpoint, Brooklyn, until March 28, Neotenic Design is a capsule group exhibition that surveys this trend. Curated by A/D/O members Justin Donnelly and Monling Lee of design studio JUMBO, the showcase identifies the movement as having close affinities with childlike physical features and the vivid emotional responses that association elicits. As humans, we are inherently drawn to objects with characteristics that resemble these human traits: big eyes, round heads, chubby cheeks, and pudgy extremities. Scientists have proven that our brains respond well to these features as it brings out our instinctual need to nurture and provide affection for less self-sufficient beings. 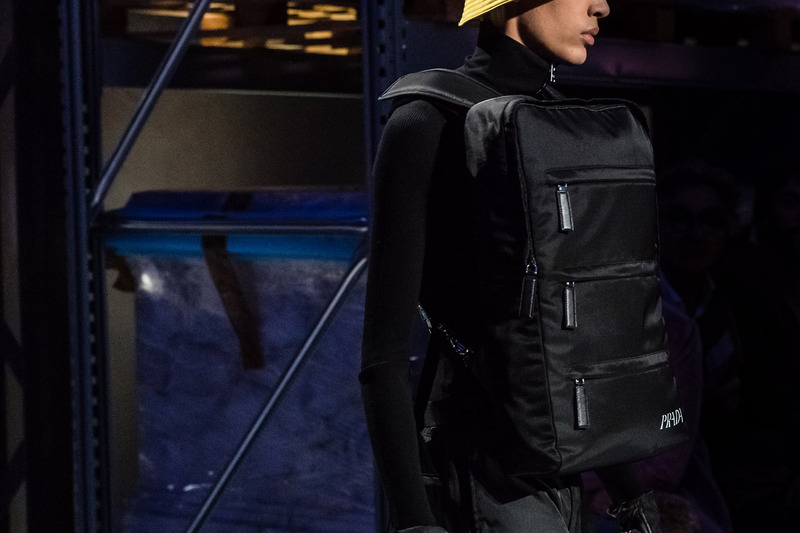 Exhibiting designers and brands—like Pierre Yovanovitch, Konstantin Grcic, Jaime Hayon, Faye Toogood, Sylvain Willenz, Chris Wolston, and Moroso, among others—have tapped into the potential of this emotive trend. There’s nuance in how this diverse group of European and American talents has employed neoteny—the retention of juvenile features—but on the whole, neotenic furniture and lighting design includes three primary traits: thickened forms; soft or rounded terminations; and the use of mono-materials. Ironically, this approach is not new and harkens back to ancient form making. What remains poignant, however, is how this recent trend asks us to reconsider the role of everyday objects; if they’re more childlike in characteristics, we might better find comfort in our domestic spaces. 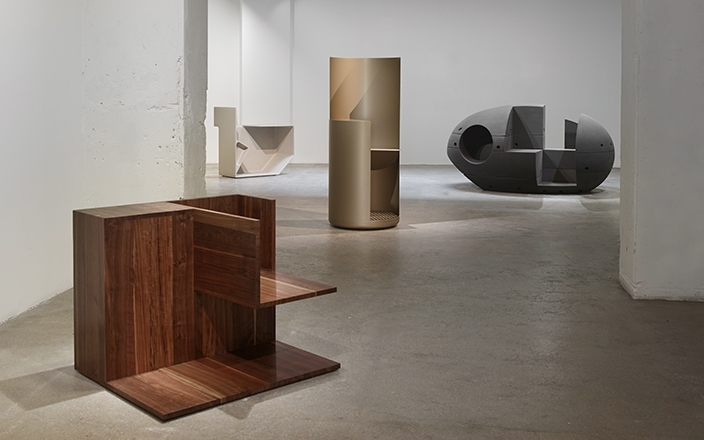 German furniture designer Konstantin Grcic has designed five chairs revolving around the spatial dynamics exhibited in St Jerome in his Study, a 1475 painting by Antonello da Messina. His exhibition, called Hieronymus (Greek and Latin for "Jerome"), is currently on display at Galerie Kreo in Paris. When looking at St. Jerome in his Study, it's clear that his specialized space, which he used to translate the Bible into Latin, has been ergonomically refined with precision to his needs. Everything, from the angle of the writing desk to the height and placement of shelving, create easy ergonomic access and allow light to illuminate this desk. St. Jerome, while in his study in 4th Century A.D., was in fact one of the first people to read silently. This perhaps says a lot about the man and the thoughtful design around him. Without getting carried way into deeper analysis, it is the chair and its contextual relationships that ultimately captured Grcic's imagination. In Hieronymus, Grcic aims to embody and amplify this sense of tailored physical intimacy. Each chair comprises different materials that range from fiber cement, aluminum, marble, anodised aluminum, and plastics used for 3-D printing. Despite their open nature, Grcic's chairs convey a sense of privacy, encouraging occupants like St. Jerome to engage in a similar approach to solitude. Each chair achieves this through cuboid cuts, staggered ledges, angular seating, and specific places to rest ones feet. This year, Grcic is also celebrating 25 years of working alongside fellow German furniture design firm ClassiCon. Meanwhile, another exhibition of his chairs, Mingx, is on show at the Salone del Mobile 2016 in Milan. This time, though, Gricic takes influence from ancient furniture design. Hieronymus runs from through to July 14, 2016, at Galerie Kreo, Paris. 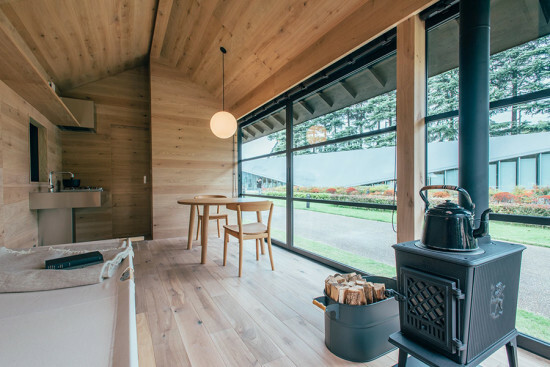 Japanese retailer MUJI teamed up with well-known designers Naoto Fukasawa, Jasper Morrison, and Konstantin Grcic to create Muji Hut, a collection of three prefab homes. The minimalistic-inspired homes made their debut during Tokyo Design Week, which took place October 24 to November 3. Muji Hut consists of three cozy, lightweight, and innovative huts: Jasper Morrison’s Hut of Cork, Konstantin Grcic’s Hut of Aluminum, and Naoto Fukasawa’s Hut of Wood. All three huts include a combination of both traditional Japanese elements and modern design aspects. Hut of Cork has designated areas for cooking, eating, resting, and bathing. The hut embraces the great outdoors by including just a shower for bathing, hinting that residents make use of the communal bathhouse or hot spring located nearby. The hut’s exterior is clad of sound-absorbing cork panels, and the interior consists of an array of tatami mats. Hut of Aluminum is comprised of an all-wood interior, which is accessible by sliding shoji-style doors. The hut features retractable aluminum awnings as well as a loft that houses a small sleeping area. Hut of Wood resembles a traditional log cabin and includes timber wood, a pitched roof, a dining table and chairs, a kitchenette, scenic views, natural light, and floor-to-ceiling glazed sliding doors. The hut is also outfitted with a traditional Japanese bath, cot, and wood-burning stove. 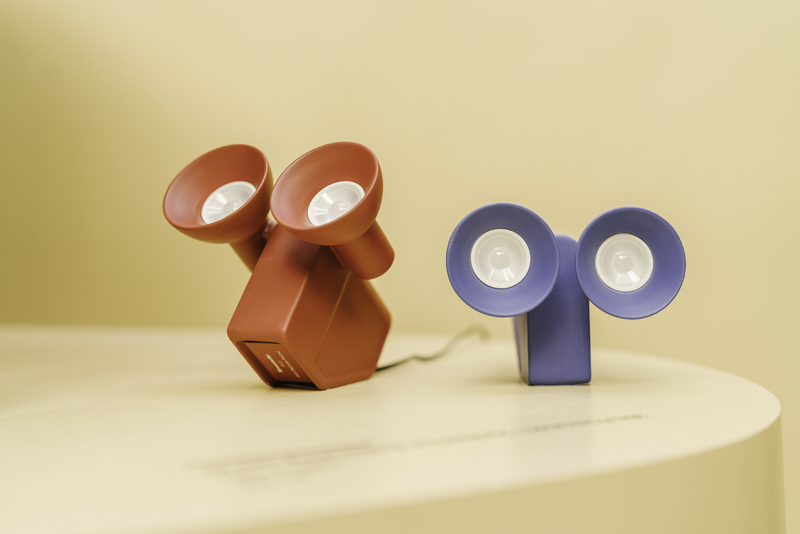 MUJI has yet to announce if the collection will be brought to market. Although the office-as-playground concept still has legs among the creative class of businesses, workplace interiors are showing signs of maturation. While communal desking remains popular, more contract suppliers are developing solutions to the acoustic and storage issues that are symptomatic of what some view as the overly-open office plan. 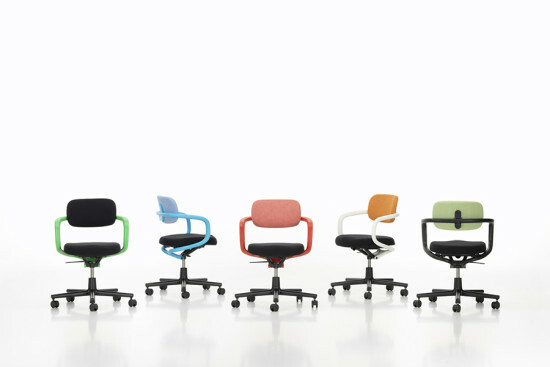 Allstar (pictured at top) Vitra A looping polyamide armrest distinguishes the design of Allstar, and represents the main structural element on which the mechanical unit of the chair is hinged. Fully adjustable, the chair is available in a variety of colors. 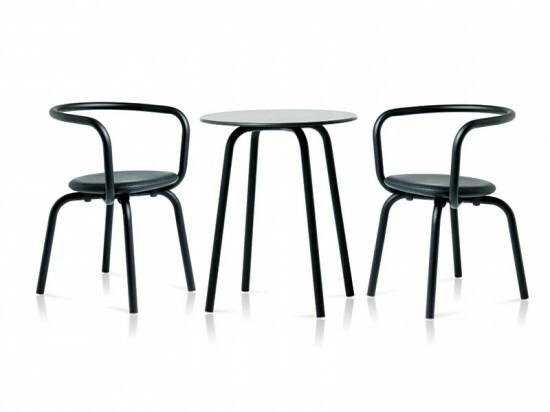 Designed by Konstantin Grcic. Steeve Arper Customizable in a wide range of fabrics, leathers and finishes, Steeve’s three versatile, modular components—bench, armchair, and sofa—can be arranged to accommodate any interior space allowing for countless configurations. Steeve’s silhouette is solid and architectural while at the same time appearing slender, light and volumetric. Its uniquely manufactured seamless back and arm covers are stretched to fit the frame; an industry innovation that eliminates the need for more complex upholstery techniques. This technique highlights Steeve’s clean design while plush interior cushions provide a soft seat. Available in a choice of base styles. Designed by Jean-Marie Massaud. sixfivezero Seating Coalesse These wood chairs are stackable up to six high for efficient storage. A wide range of shell, base, and upholstery choices allow for a myriad of finish combinations. Coordinating tables are available. Designed by Lievore Altherr Molina. Concierge Bernhardt Design Sleek and versatile, the Concierge is a workstation that can be customized to fit specific needs. The design lends itself to incorporate televisions, whiteboards, and charging stations for both laptops and mobile devices. Offered in five materials, two heights, and six base options. BuzziFalls BuzziSpace Patterns are CNC-cut into two layers of proprietary acoustic felt. The product can serve as a decorative room divider or be hung in front of a wall, acting as dimensional wallpaper with acoustical properties. Designed to be hung from a ceiling fixture, it comes with a metal profile and a set of cables. Available in seven motifs and two sizes. Designed by Sas Adriaenssens. Bloom Kimball Casual and sophisticated, Bloom fits comfortably in a variety of settings. United by the same base design, the lounge chair offers a tailored seat with optional contrasting fabric, while the occasional tables come in a range of shapes, heights, and materials. Once again, top-drawer design talents—Ronan and Erwan Bouroullec, Konstantin Grcic, Ingo Maurer, Nendo, and Daniel Libeskind among them—claimed the limelight at the last Salone del Mobile. More than 300,ooo attendees navigated the halls of the Rho exhibition center, while closer to the center of Milan, satellite shows and exhibitions drew crowds to more avant-garde events. Here's a selection of our favorite pieces. Rival Artek While created as a work chair for the home office, this swiveling seat has a distinctive presence. 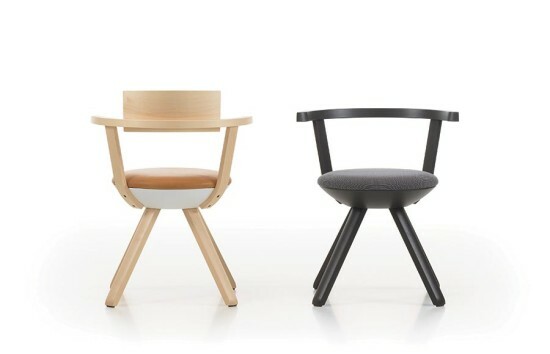 Fabricated of birch, in high- and low-back styles; leather and fabric upholstery. Designed by Konstantin Grcic. Flying Flames Ingo Maurer Repositionable downlights and dimmable LED “candles” are held by magnets to a ceiling-mounted canopy that contains an integrated electronic ballast. Designed by Moritz Waldemeyer and Ingo Maurer and team. SU Collection Emeco These simple stools are offered with seats of reclaimed oak, recycled polyethylene, or an eco-friendly “concrete” material, atop legs of anodized aluminum or wooden legs. Designed by Nendo. 22nd Floor Moroso Folded steel and aluminum comprise an all-in-one seating and table unit. Varying the palette of textiles and surface materials creates a custom design. Designed by Tord Boontje. Carbon Fiber Chair Coalesse Weighing less than five pounds and capable of supporting 300 pounds, this stacking chair takes full advantage of the technical properties of carbon fiber. Designed by Michael Young. Shanty Summer BD Barcelona Design Each of the corrugated door panels fronting this cabinet opens in a different direction. Available in several color schemes. Designed by Doshi Levien. Paul Smith & Maharam Carl Hansen & Son Modern classics including the Wing Chair, the Shell Chair, CH28, and the CH163 sofa all receive the signature striped treatment. Textiles by Paul Smith & Maharam; chair designed by Hans Wegner. Paragon Artemide A body of extruded aluminum in matte black or anodized grey finishes, this blade-like floor fixture uses a dimmable LED lamp. Designed by Daniel Libeskind. N=N05 Casamania Breaking apart the components of a traditional sofa, this chair’s seat and backrest float separately, but are linked together by a thin exposed framework. The integral side table is made of ash wood. Designed by Luca Nichetto and Nendo. Big Will Magis This wheeled work or dining table extends to seat eight. The witty wheel-like pair of legs slide for easy expansion. Designed by Philippe Starck. Tuareg Foscarini This tubular fixture’s three LED light sources adjust 360 degrees and can be operated independently, allowing it to be used as a reading lamp, wall lamp, or floor lamp. Designed by Ferruccio Laviani. Design Miami is all about furnishings as art, parties, being someplace warm in December, and more parties. It’s not so much about architecture, except that the most riveting eye-grabber is often an installation by an architect. In 2006, Zaha Hadid, named Designer of the Year, created a plasticene web of wonder that ensorcelled the interior atrium of the Moore Building in the Design District. 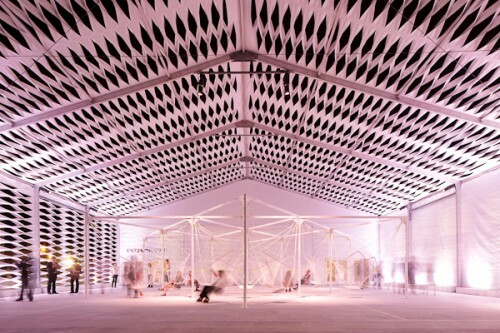 More recently ArandaLasch created tents set up closer to the action and directly in front of the convention center where Art Basel Miami Beach is located. This year the tent went to New York architects Moorhead & Moorhead. They worked in collaboration with ArandaLasch who fitted out the interiors. This year’s Designer of the Year, Konstantin Grcic elected to put his installation in the tent-shaded courtyard: his Netscapes are structurally intense hammocks, swing sets for real swingers, as it were. The morning after opening night, we talked to Granger Moorhead about their tent installation: “We had to cover a lot of area on a limited budget [$40,000], so we decided to work as much as possible with existing rental tents. We started with those solid vinyl panels that are basically floppy and flat. Then we slit them with an offset pattern and folded them in and out and fixed them with aluminum pop rivets to create tension and to make them volumetric. The openings allowed for light and air and a very pleasant atmosphere for hanging out on the hammocks.” Two tents are set up side by side with the smaller one serving as an open forecourt with partially slit sides to show off the process and the transition, a favorite Moorhead & Moorhead motif. The larger portion is left untouched. “We started working on it conceptually six months ago but because it’s in a parking lot, it had to go up really fast, in a week and a half,” said Moorhead. He added that the best part of Design Miami so far was finding a Miami edition of the Shake Shack, but with no lines. Konstantin Grcic: Decisive Design currently on view in The Art Institute of Chicago’s new Modern wing marks the first stateside showcase of the Munich-born, London-trained designer. Curated by Zoe Ryan, the exhibition is the fifth installment of the museum’s A+D Series that previously featured Chicago architect Douglas Garofalo and graphic design firm Graphic Thought Facility. It’s also the first show with a subtitle. Although delightfully alliterative, “Decisive Design” is a misnomer. It sets up Grcic, a craftsman who studied at the Royal College of Art and came of age under the sly wit of designers Jasper Morrison and Ettore Sottsass, as an exacting decider. Sure, the 100 plus objects in the gallery reveal that Grcic is always searching logical production methods and that he takes an honest approach to materials, but the products themselves tell stories richer than pure functionalism. Take, for example, the Wanda dish drainer from 1997, which greets visitors near the gallery entrance. Circular and double stacked, Grcic’s wire rack is functional with a Dada riff. Ryan’s walltext and accompanying images compare the work to Marcel Duchamp’s Bottle Rack from 1914, a classic readymade intended to question the nature of art and the nature of the gallery. Here, placed in a design exhibition, the references are circular: everyday product to readymade, readymade to everyday product. That this deliberate feedback loop seems closer to Grcic’s vision than any functionalist credo is seen in the overall exhibition design. Products line the perimeter of the rectangular gallery, but for the most part they don’t hang on its very white walls. Instead, the bulk of Grcic’s output—process models, chairs, wastepaper baskets, cups and saucers, sketch reproductions, light fixtures, and inspirational photographs—sit humbly in a narrow trough or lean gently against the wall. The gallery’s center is features an oval inexplicably composed of stacked tires. (The press release credits the design to Grcic’s love of Formula 1 racing.) Inside the track-like ring, visitors can test drive Grcic chairs and benches. But the walls are reserved for larger than life photographs of Grcic’s office, Konstantin Grcic Industrial Design, founded in 1991. His workspace is emptied of employees, as if everyone simultaneously left for lunch. As windows into the designer’s process these images are compelling, but enigmatic. Are they meant to celebrate the kind of creative tableaux made famous by the Eameses or bond Grcic’s quotidian mess with the viewer’s daily life? Ryan and Grcic, who designed the exhibition, leave the questions open ended, preferring, it seems, to let the accumulation of products and images speak for themselves. One oversized photograph features the jumble of Grcic’s library, shelves overstuffed with titles and hung with poster from a 2002 Ed Rucha exhibition. “The Future is Stupid,” it reads, an ironic touch from a designer on the cutting edge of fabrication technologies. In fact, the iconic Chair ONE foregrounds the image. 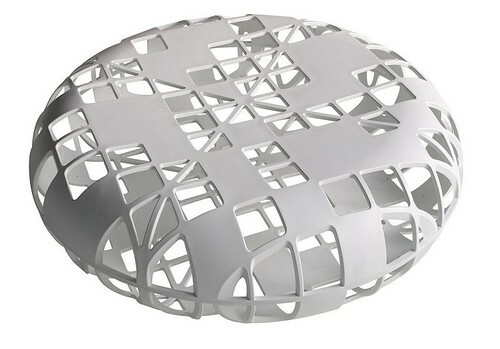 With its crystalline shape and die-cast aluminum construction, the chair represents Grcic’s ongoing experiments with digital modeling and testing. Just a few yards away, the tuffet-like Osorom bench is on display. Like Chair ONE, the 2002 bench was developed digital techniques. Moroso called on Grcic to create a design that could be fabricated at 1:5 scale using rapid-prototyping. Taken with his model, the company decided to fabricate the piece, ultimately fabricating it out of molded fiberglass. And again, the featured product is called into conversation with the photograph behind. A white version of the filigreed bench is tilted up against an image of a woman staring out from behind a black burka. The formal match between the eye openings in her garment and the solid-void perforations of Osorom is uncanny, but as with other behind-the-scenes moments in the show, the meaning is unclear. The clarity of Grcic’s singular vision is cluttered. Is it chance juxtaposition or decisive design? 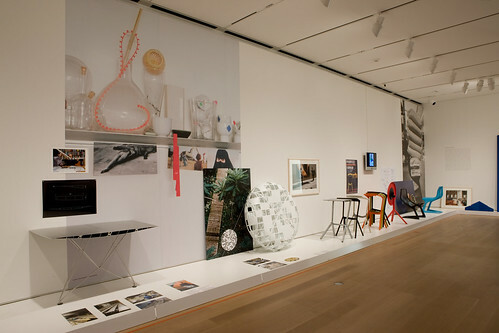 Konstantin Grcic: Decisive Design is on view in The Art Institute of Chicago through January 24, 2010.